Cheese food slices (35 %) with added vitamin D. Butter flavour wheat crackers. Cooked cured ham slices (31 %) formed from pork leg pieces with starch. 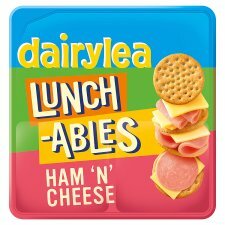 Dairylea Lunchables Snack Pack contains wheat crackers, formed ham and cheese food slices.